Lima pallet employee, Jason Hundley, watches U.S. 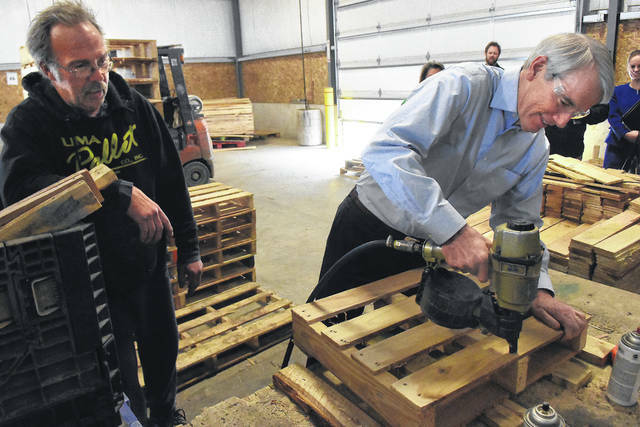 Senator Rob Portman, uses an air gun to build a pallet during a tour of Lima Pallet Company on Monday. U.S. 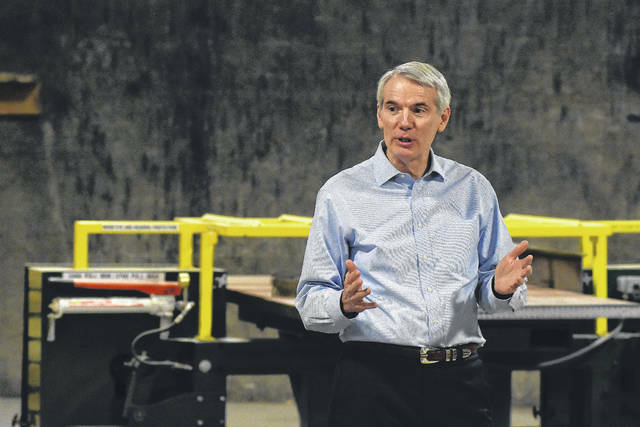 Senator Rob Portman, addresses a audience after a tour of Lima Pallet Company on Monday. LIMA — It may not have been U.S. Sen. Rob Portman’s first time using a nail gun, but he would have a hard time hitting the $25-per-hour piecemeal wage that many of Lima Pallet Company’s employees are able to earn at his pace. Portman picked up the tool Monday afternoon as part of a regional tour of Ohio highlighting the businesses that have been investing in its workers and other capital after the passage of the Tax Cuts & Jobs Act this last December. As a result of the cuts, owner Tracie Sanchez said the Lima Pallet Company has been able to give 2-percent raises to her roughly 50-person staff, purchase a pallet dismantling machine and expand her business. The tax cuts for individuals are slated to disappear by 2025, but Portman said there’s a good chance that they will be renewed when the time limit is up, no matter who is elected. He gave an example of former President Barack Obama’s approval of the Bush tax cuts. Portman also pointed out how the tax cuts have made the world market a more competitive place for American businesses because of the lowered federal corporate tax rate, which currently stands at 21 percent. “It’s a pretty good time to be an American company,” Portman said. The exact result of the Tax Cuts & Jobs Act has yet to be determined, as its effects have just begun to sink into the economy, but overall optimism for small businesses is high, according to the Small Business Economic Trends Survey. According to the latest figures in February’s job report, wages have risen by 2.6 percent comparable to last year. Economists, however, point to a number of potential factors influencing those numbers — increases in minimum wages in a number of states, a low unemployment rate hovering near four percent, a lack of skilled workers as well as the business optimism created from the Tax Cuts & Jobs Act. As part of the senator’s Monday visit to Lima, Portman also toured the Joint Systems Manufacturing Center and spoke at the Lima Rotary Club.